The 44th ISDT seventeen nations competed, eight of which had six man Teams in the Premier TROPHY Event, 321 Competitors at Garmisch Partenkirchen, at the Olympic Snow & Ice Stadium September 15th to 22nd inc…. First day’s lap of a 77 1/2 Miles circuit. 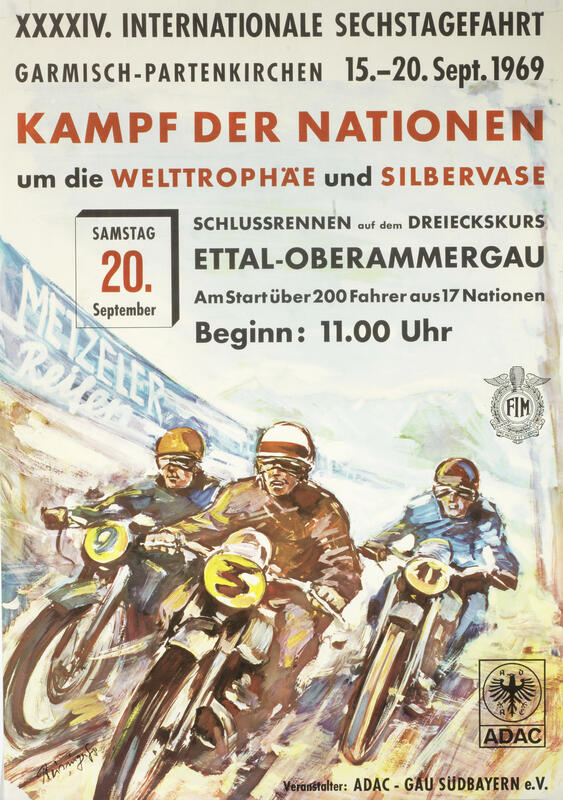 A severe Hill climb at Hammersbach, second time control at Oberammergau & refuelling stop at Altenau indicated it wd not be an easy event & by 1.30 on the first day 23 riders had retired. 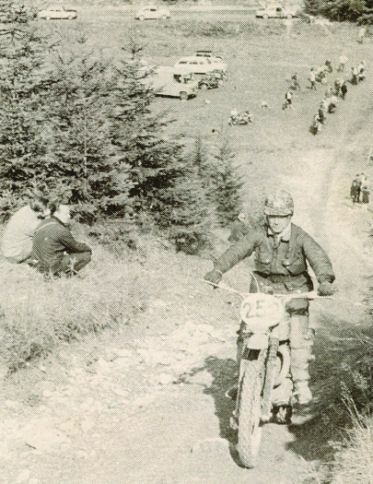 After finishing bottom in 1968 in Italy, Alan Kember was made team manager for this. 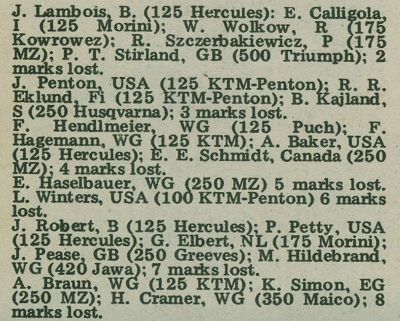 John Pease lost a mark or two during the week, Dommett suffered a ignition failure & retired on forth day Britain became third placed and far better than previous year. 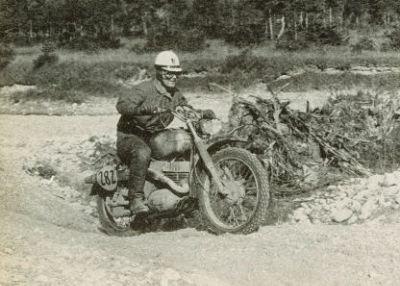 490cc Triumph Twin was bored to be used in three different capacities. This page has been the courtesy of Arthur Williams & Dave Martin & many many more good guys. This was the year when single makes needed three different sized machines, and East Germany again led from the start. 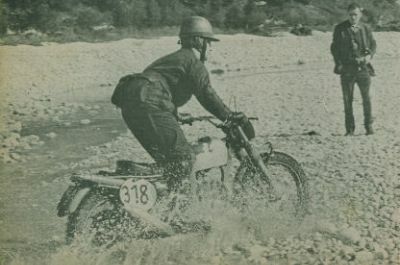 For five of the six previous years preceding this, East Germans were the foremost team, again they were immaculate and Jawa mounted Czechs were also unpenalised to the final day. 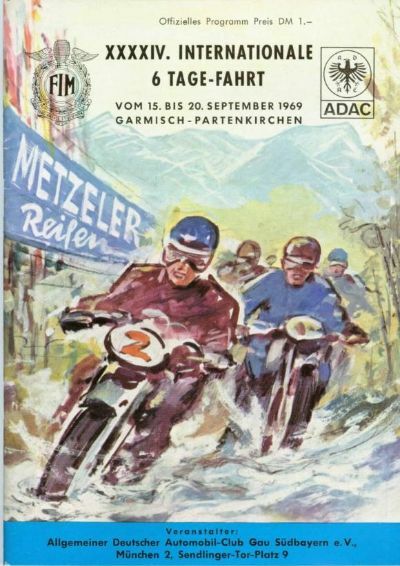 Previous year’s winners West Germany used largely small capacity Zundapps of surprising actual power, though Heinz Brinkmann’s 50cc machine had it’s gearchange broken on the third day. Andress Brandl was excluded for receiving outside assistance, Russia lost a man on the first day whilst Italy plus Sweden had a man retire on the second day Austria lost three men at that same stage. 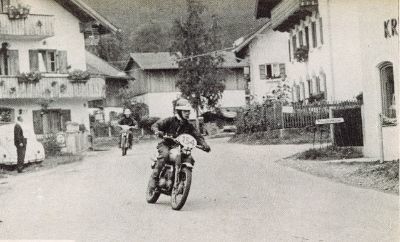 Herbert Schek over two metres tall with one of the three only 750cc BMWs entered. No fewer than twenty-four of four man National Teams competed for the Silver Vase. 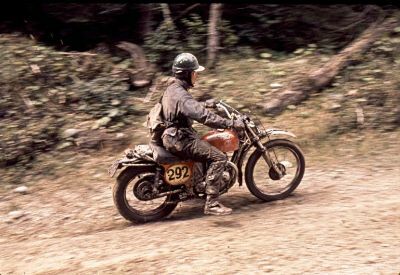 No restriction on country of origin for machinery used, six teams went through the week losing no marks whilst the two home teams on an assortment of Jawa, Maico, Puch and Zundapp. 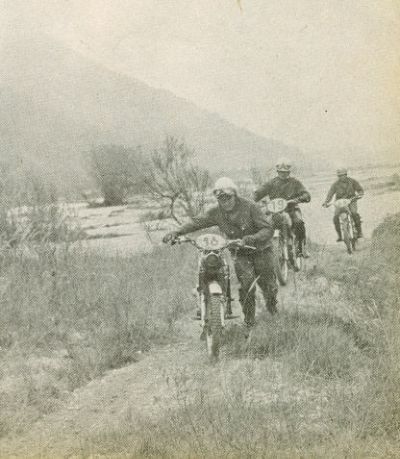 Two Italian Teams all Morini mounted rode to the finish, West Germans plus Czechs showing the way in special tests. 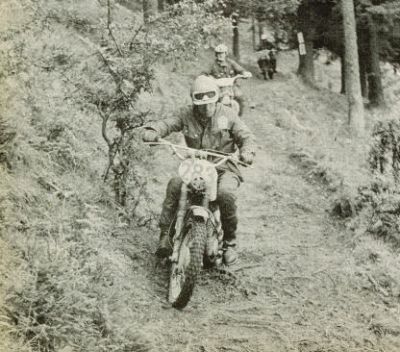 On special tests the speedier two stroke Puch & two stroke Zundapps of West Germany Vase ‘A’ quartet led home to win. with the other home team’s second hopes making second. Preston Petty USA 1969 famous almost legendary maker of the first unbreakable plastic mudguards. Neither of the GB Vase teams went well, first two days saw three members of the B side (all Scottish) exit by day two end leaving a lone Derek Edgar on a 125cc Puch to plough on to a Silver after dropping just 14 marks. 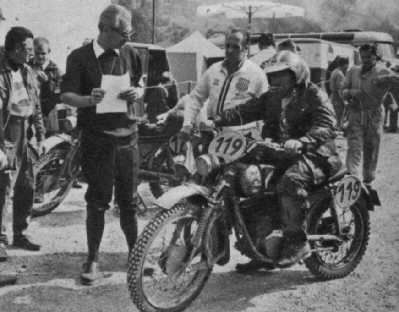 The All Service Riders British Team in 1968 had all finished despite horrific mechanical problems & the same set-up was tried in 1969 however with even less success. 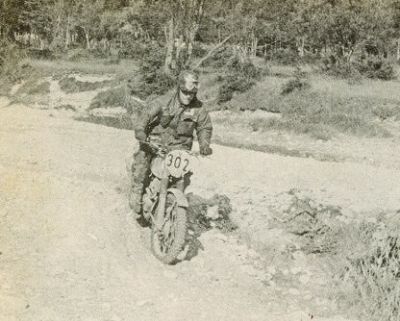 Fl/Lt Jon Tye’s Puch lasted less than two days, one of the three Army BSAs ridden by Tom Fayer suffered the old BSA problem of Ignition failure, the other two BSA Army lads stayed the course with Mick Soames getting Gold & Mick Noyce #21 marks down a Silver. 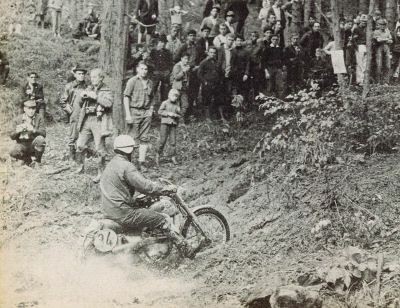 It appears that the rider here is actually Herb Uhl the father of Billy on the bike.. Outside assitance? probably not. 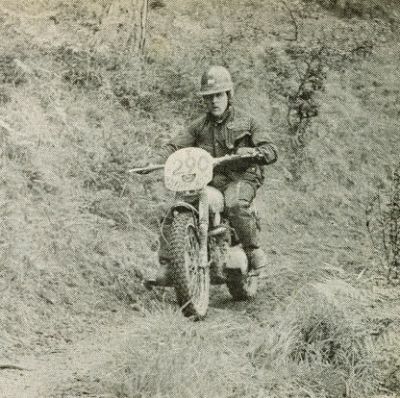 Individual Brits entries saw Gold for Scott Ellis on a Puch, Gordon Farley on a Montesa, Mick Wilkinson on a Greeves, with Ken Heanes in the 750cc Class, eight Golds out of Forty Seven entries. First day retirements included Russian Trophy man Victor Pylaev 350cc IZH, Ian Millar 125cc Puch of the British Vase B Team with frame problems. 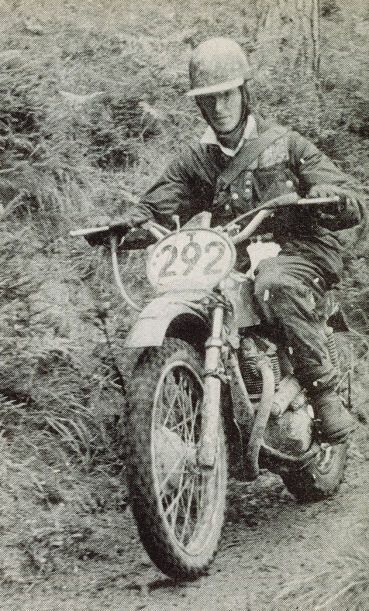 Scottish ACU Clubman Jimmy Ballantyne BSA 25cc0 was in Hospital with both legs broken after running into a Lorry. 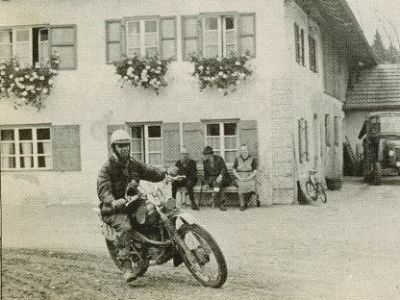 Italian hard case Tullio Masserini on a 75cc Lambretta Scooter was eliminated by the clock as was Brit veteran Frank Carey on a 125cc Suzuki. Jean Crosset took 5 golds in ISDT’s, placed 14th this time. 34 Factory three man Teams, twelve of whom got through without losing a mark. Moto Morini represented by four Teams, three Czech Jawa, and two MZ plus one Simson from East Germany, one Maico plus one Zundapp of West Germany. 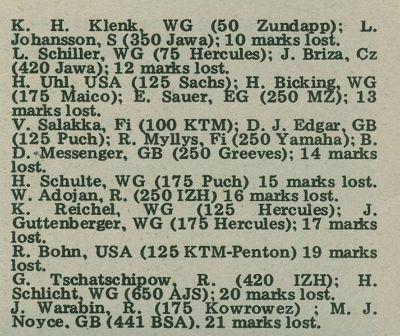 Out of 28 Club teams just one lost no marks, Automotoklub Praha of Czechoslovakia Vaclav Jirku, Martin Just on 175cc CZ’s and Josef Cisar on a 250 Jawa. 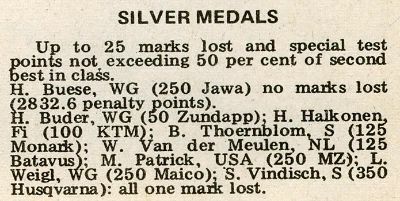 Silver Vase had quickly become plain, Britain B had lost a rider though Holland B, USA A, Canada and Belgium A had all dropped marks. SECOND DAY had steep climbs at start plus end of the course & on a 76 1/2 miles course lapped twice a further 67 riders were ‘OUT’. Only East Germany leading as result of special tests, West Germany & Czechoslovakia had no marks losses. 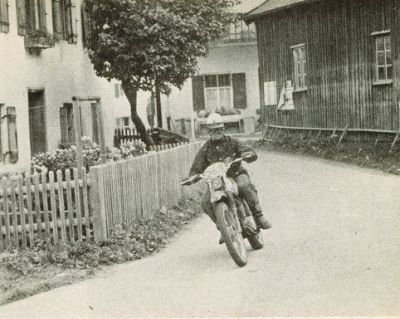 Sweden’s Lars-Erik Johansson 250cc Husqvarna & Italian Fausto Vergani 100cc Morini were out costing their Teams 100 marks per day, Russian Lew Voronovitsch 250cc IZH adding 39 marks to the Team total, Austria then had three teamsters suddenly with ignition problems, Stefan Pachernegg 50cc Puch, Siegfried Stuhlberger 50cc KTM and Walter Leitgeb 175cc Puch. 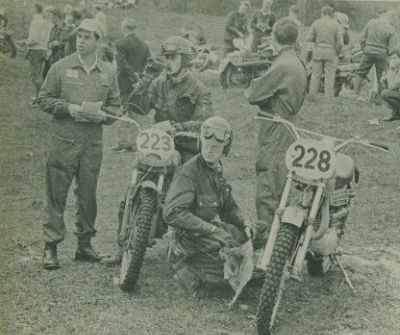 USA now competing regularly since 1964 had a 100cc to a 125cc KTM-Penton riding team only 38 marks down, plus their USA Vase A team on an assortment of Swedish, East & West German machines were only 56 marks down. British B Vase Team now lost Donald Buchan with ribs damage after a crash on his Greeves then Ernie Page on his Puch 125cc having his clutch pack in leaving B Vase team to consist of ONE. Jon Tye, Puch also dropped out to let Vase A team incur 100 Marks daily. 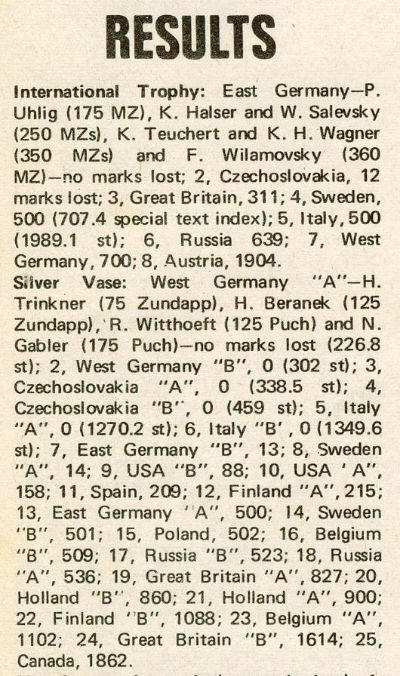 After 2nd Day there were 7 remaining Vase Teams, in order of points gained in special tests:-Czech A, West Germany A, West Germany B, Czech B, East Germany A, with Italy A & B. 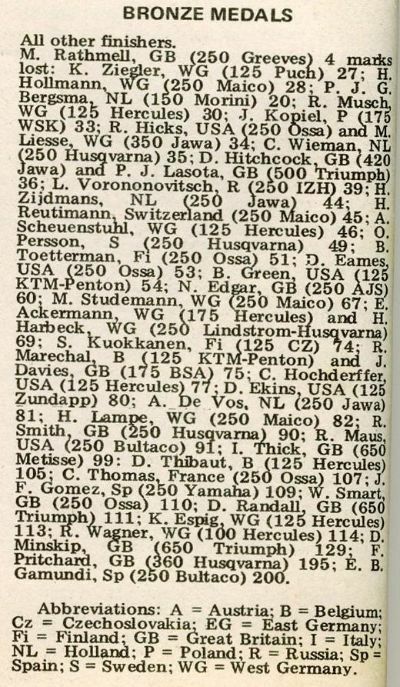 Only two Club teams by second day end without penalties from East Germany and Prague, the British London Metropolitan Police team sadly losing their David Hobbs with a hopelessly gashed tyre. 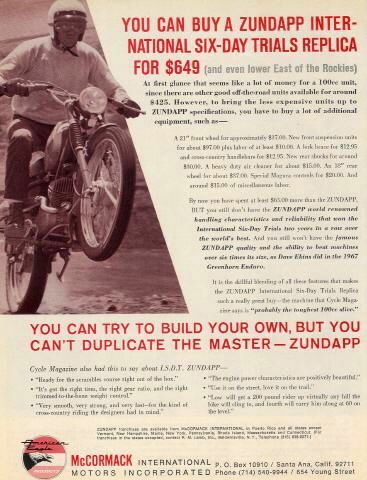 Special Tests saw Zundapps setting the pace for 50cc 75cc 100cc 125cc classes with East German MZ exponents leading 175cc 250cc 350cc and 500cc Classes, and a hard trying Roy Peplow on the 504 Triumph topping Kurt Distler & Herbert Schek on monstrous 750cc BMWs Colin Dommett justifying his selection in the Trophy Team and Johnny Giles proving fastest four stroke man in the 500cc Class. 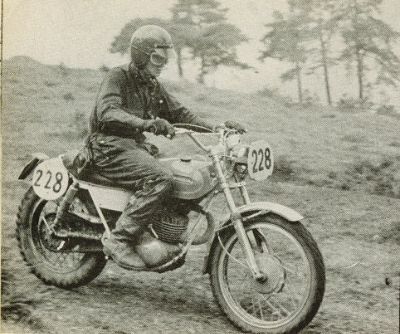 Malcolm Rathmell the Bultaco King had a Brief spell at the ISDT for a Comerford (I think 250cc) Greeves again not sure but a Gold Medal ride on the very last speed Trial day saw a plug change drop him from Gold to Bronze. Always doubts when machine makers blame a plug!, however all remain loyal to their plug brand!! !, this was even the standard cause in TT and GP’s!. Third day saw only ten retirements and one of the harder Hills was dispensed with. 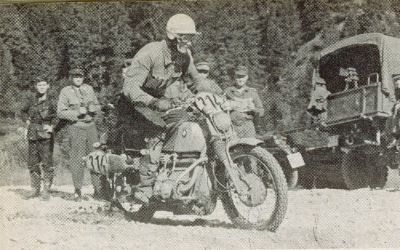 Special Test star Heinz Brinkmann 50cc Zundapp, previously unpenalised for the West German Trophy was suddenly out with gearbox failure. 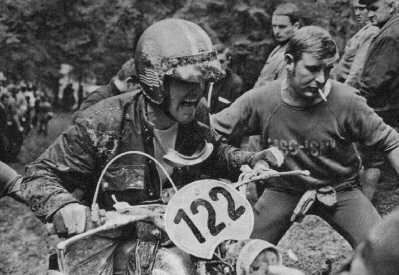 West German A Team moved up to lead the Czech teams then Erwin Sauer MZ 250cc lost 13 marks for East Germany B team and the results changed. Halfway thru, 221 remained and the unpenalised Vase teams were down to six!. 125 individuals remained with chances to gain GOLD. The forth day a two lap 91mile circuit started being used around the Walchensee, heavy useage of the virtually dry Isar river bed with long climbs & descents & the finest scenery money could not buy. 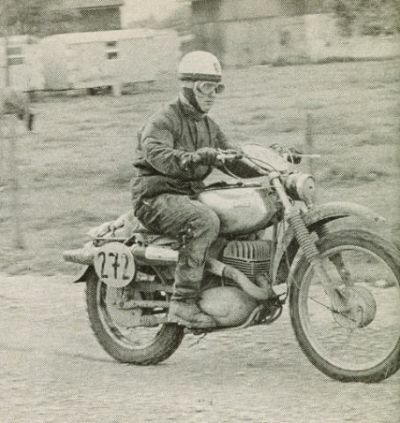 On forth Day Ignition failure became an epidemic, Colin Dommet out of British Trophy team, Tom Fayers out of Vase A Team, then another Army MCA teamster George Webb 441cc BSA ran into a group of Russians turning around on the course and escaped personal damage but wrote his machine off. 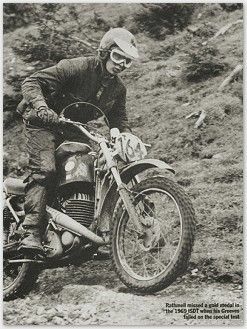 West German Andreas Brandl 50 cc Zundapp was ruled out as having received outside assistance when his gearbox gave up the ghost. 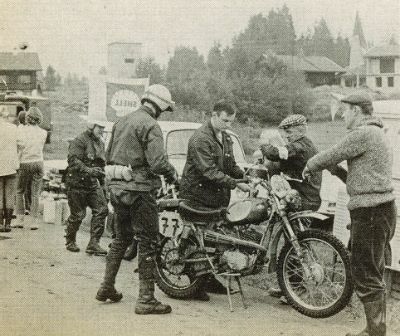 Same day Kurt Distler 750cc BMW and Kurt Rentscler 420cc Jawa were spotted conducting outside rules repairs! 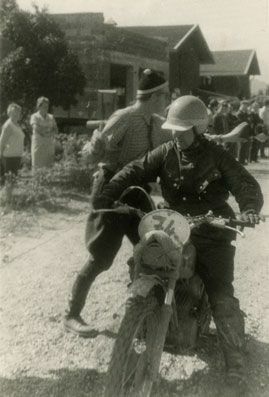 and a forth Member of the Austrian Trophy Team Franz Dworak 175cc had his ignition pack up entirely. East Germany A had Rudolf Jenak 50cc Simson out with Ignition Failure on their new battery free Bosch ignition. Both Russian Teams, one Finnish with a Polish plus Canadian Teams now out of the Silver Vase tussle. 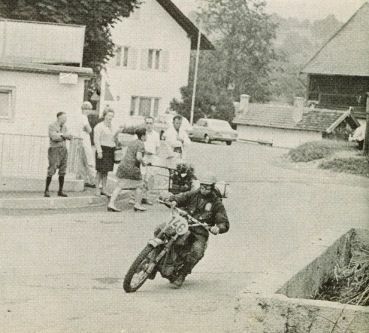 Photo of East German winners top scorer #282 Fred Wilamowsky on his 360cc CZ. 6th Day, before the final half hour speed test on a 4.35 miles triangular road circuit between the Ettal Monastory and Oberammergau a 77 miles final stage had to be covered. 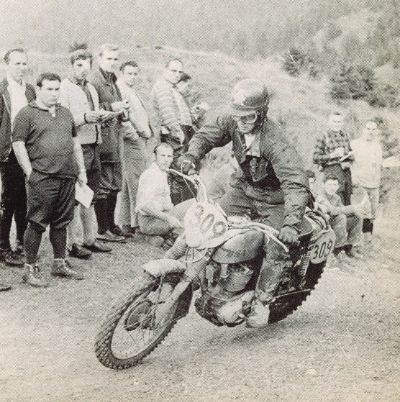 The sick and lame all made it to the circuit and the likes of a Bultaco mounted Spain entrant with a well wobbly wheel, there were others losing points on the speed circuit. Czech Trophy team man Jaroslav Briza had his contact breakers give out after three of his required six laps. 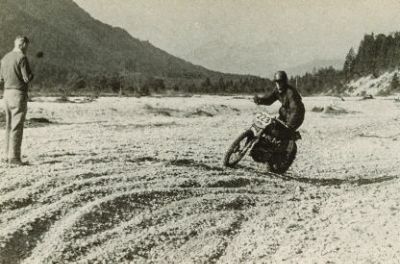 Klaus Simon could not manage his total of six laps and settled for four. Malcolm Rathmell had his Sparking Plug problems dropping him from Silver, he had dropped previously from Gold just by his Chain breaking on a special test. Britain finished third. In addition to the press articles and pictures we have a video clip of this event here also for other events for you to enjoy on our video gallery. 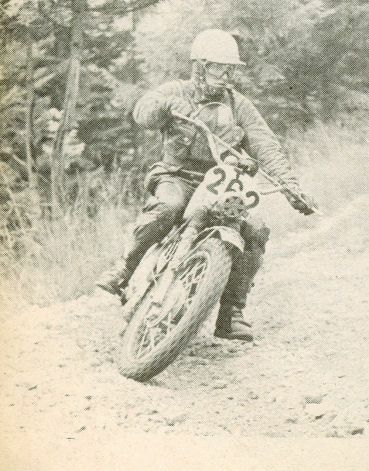 I am working for a french vintage magazine “Moto Légende” and I am writting a article about the BSA 441 Victor. Would it be possible to used your photo of Gerry Galloway. If you agree, would you mind to send me this picture in a good definition and all your mention, copyright and conditions. I send you back a magazine as soon as it’s get ready. Richard, I am sorry to take so long not to get back before. I have checked the images and the one you want was given to Taff when he ran the site and the only copy we have is a low res. I have passed your enquiry onto Brian Catt who has some images of that ere. The photograph identified as Billy Uhl is actually his father, Herb. With a cigarette, no less.